"Washington Americans" has a nice ring to it. And Robert Griffin III would look great in red, white and blue. Not so fast. Nothing is changing just yet. A. What is the meaning of the matter in question, as it appears in the marks and as those marks are used in connection with the goods and services identified in the registrations? B. Is the meaning of the marks one that may disparage Native Americans? In other words, the board had to determine if the term "Redskins" as used by Washington's NFL football team refers to "Native Americans," and if so, is that term disparaging? Regarding question A, the evidence was obvious and overwhelming. Washington's NFL football team sports an image of a Native American man on the side of its helmet. Older photos of the team's cheerleaders and marching band refer to "dancing Indians" and feature both groups decked out in mock Native American garb and feathered headdresses. Between 1967 and 1979, the team's media guides featured Native American cover imagery, including a drawing of a giant Teepee atop RFK Stadium. Question B is more nuanced, and at the heart of the debate over the team's moniker. Washington NFL team owner Dan Snyder and other nickname defenders -- including league commissioner Roger Goodell -- repeatedly have insisted that "Redskins" is a term of honor and carries no malicious or derogatory intent. Unfortunately for Snyder and Goodell, the board ruled that the Washington NFL team's true intentions -- whether to honor a particular ethnic group or simply squeeze additional dollars out of a well-known sports brand -- are irrelevant. Instead, what matters is whether a "substantial composite of the referenced group" (that is, Native Americans) finds the term to be disparaging. Hold up. What does "substantial composite" mean? Irony! In a case about the meaning of words, the definition of "substantial composite" is surprisingly unclear. According to the board, federal law "prohibits registration of matter that disparages a substantial composite, which need not be a majority, of the referenced group." So a majority of Native Americans don't have to find the nickname disparaging for Washington's NFL team to lose the case? The board found that at least one in three Native Americans considered the term "Redskins" to be disparaging when used in connection the Washington NFL team between 1967 and 1990, the time period during which the trademarks were registered. How did the board come up with that 30 percent figure? Did someone conduct a series of Native American public opinion polls over the last half-century? Nope. Primarily, the board relied on a series of anti-nickname actions and statements from the National Congress of American Indians, which during the time period in question purported to represent approximately one-third of all Native Americans. What kind of actions and statements? Did the board find other evidence that the term "Redskins" is disparaging? • A linguistic expert found that the term always has referred to the skin color of Native Americans, while a second scholar noted that "nearly half of all interracial slurs" refer to physical differences, and most of said differences refer to skin color. • Several dictionaries published between 1967 and 1990 refer to the term as "often offensive," "often disparaging," "contemptuous" and "not the preferred term." • Similarly, a linguistic expert's search of magazine and newspaper articles published between 1975 and 1989 found 71 distinct stories in which the term was used to refer to Native Americans -- and not once was it used as a standard, neutral term. To the contrary, many of the articles used the term in "the context of racial slurs or discrimination." Hmmm. Does that last observation have something to do with both Snyder and Goodell refusing to answer the question when asked if they would call a Native American person "Redskin" to their face? What counter-evidence did Washington's NFL team offer? The team submitted historical letters of support for the nickname from five Native American tribes; other evidence showing that not all Native Americans object to the term "Redskins" when used in reference to professional and high school football teams; and evidence that at least two tribal high school teams used the nickname themselves. Oh, and then there's a Land O'Lakes unsalted butter carton and a scene from the 1996 film Courage Under Fire featuring Lou Diamond Phillips, which presumably matters because -- well, actually, it's hard to say, but Jack Dickey of Time magazine has more here. How come that didn't sway the board? If many or most people don't care -- including some Native Americans -- then what's the problem here? Was there a dissenting opinion? Ah. So at least one of the three judges on the board is cool with the nickname? Not quite. In his dissent, Bergsman also notes that: (a) he isn't suggesting the term "Redskins" wasn't disparaging during the time period in question; (b) his objections have nothing to do with whether the nickname is disparaging today. Which trademark registrations did the Washington NFL team actually lose? According to the ruling, the term "Redskins" is subject to trademark cancellation for "entertainment services -- namely, football exhibitions rendered in stadia and through the media of radio and television broadcasts." Actually, yes. The team's cheerleading squad won't be able to honor Native Americans by using the trademarked term "Redskinettes." 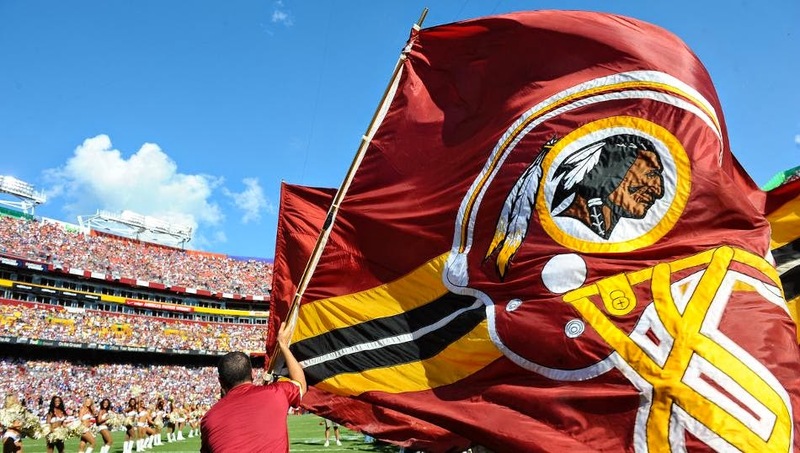 Does the Washington NFL team lose its "Redskins" trademarks immediately? Nope. The team already has announced its intention to appeal the ruling, a process that could take years and end at the Supreme Court. Until that process is complete, the trademarks will remain intact. So Snyder isn't being forced to change the name by thanks, Obama politically correct tyrants bureaucrats in Washington? If that's the case, then why is this news a big deal? Simple. Wednesday's ruling is a major first step toward Washington's NFL team losing its federal trademarks. If that happens, federal law will no longer protect the team from bootleggers and copycats selling merchandise featuring the term "Redskins" -- an outcome that a team lawyer once said would cause the franchise to suffer "every imaginable loss you can think of." So basically, losing trademark could hurt the team by weakening its intellectual property rights and cutting into its bottom line? Correct. Other companies could grab market share and/or undercut the team's merchandise prices by flooding the market with cheaper knockoff "Redskins"-labeled goods. Sweet! So assuming Washington's NFL team loses its appeals, I'm free and clear to start a Café Press "Redskins" T-Shirt business? That said, American University law professor and trademark law expert Christine Haight Farley told Erik Brady of USA Today that as far as she knows, no one has ever sued for trademark infringement based on a common law mark when the mark's registration has been canceled as disparaging -- something that could vex Washington's NFL team in court. "I think it is entirely possible for a court in that circumstance to say, 'You've come to a court of equity with unclean hands and we are going to deny you your remedy,'" Farley told USA Today. "We don't really know what would happen." OK. Losing federal trademark protection could put financial pressure on Washington's NFL team to change its name. Would it also put pressure on the league itself? Yes. As I've mentioned before, 31 of the NFL's 32 teams (the Dallas Cowboys are lone holdouts) pool and equally split their merchandising revenue, which means that any hit to sales of Washington-branded ballcaps, keychains and beer cozies is a hit to the entire league. In addition, The New York Times notes that if more counterfeit Redskins gear is available, it will hurt companies such as Nike, which has the exclusive license to sell league apparel. In other words: If Washington loses its trademarks and Snyder doesn't change the team's name, he could get irate phone calls from Goodell and Phil Knight. Are Washington's NFL team or the league under any other pressure to change the nickname? Lots. The D.C. City Council unanimously approved a resolution condemning continued use of "Redskins." Fifty U.S. Senators recently sent a letter to Goodell calling "Redskins" a racial slur. A few weeks ago, the NCAI and Oneida Indian Nation sent a letter -- cosigned by 77 other groups, including civil rights and religious organizations -- to every NFL player, asking them to speak out against the nickname. Numerous writers and journalists have criticized the name, including strange bedfellows Charles Krauthammer and Bob Costas. During the NBA playoffs, the Yocha Dehe Wintun Nation, a California-based tribe, aired a powerful NCAI-produced commercial calling for change. Last year, three former Federal Communications Commission executives sent a letter to Snyder not only decrying "Redskins" as an "unequivocal racial slur," but also arguing that a federal indecency case could be made against broadcasters who air the name, much as cases are brought against networks for airing "obscene pornographic language." Perhaps unsurprisingly, Washington's NFL football team hired a lobbying firm in May to represent it on Capitol Hill. Travis Waldron of Thinkprogress.org reports that the team also has consulted with a group of high-profile Republican advisers, including messaging consultant Frank Luntz (father of the terms "death tax and "climate change"), former Bush Administration press secretary Ari Fleischer and former Virginia governor and U.S. Senator George Allen. Wait -- the same George Allen who was caught on video repeatedly referring to a 20-year-old man of Indian descent as a "macaca?" He's giving Washington's NFL team advice on racially offensive language? Yep. Though it ought to be noted that his father George used to coach the team, and his brother Bruce is the current general manager. Is that the most ham-fisted public relations move the Washington NFL team has made to defend its use of "Redskins?" Hardly. Last Fall, a team representative wrote a column for a national sports website stating that his Blackfeet Indian father-in-law wasn't bothered by the nickname, and that "White America" and "every other sports writer" calling for change on behalf of unbothered Native Americans essentially had the same mindset as the people who put Native Americans on reservations. Subsequently, said father-in-law wrote an article for the Indian Country Today Media Network calling the nickname "racist" and claiming he had been misquoted. A "team representative?" Wasn't that Rick Reilly? Oops. My bad. Still, the Washington NFL team has committed a number of embarrassing gaffes, including (but not limited to): a #RedskinsPride Twitter campaign against nickname critic Senate majority leader Harry Reid that badly backfired; airing an interview on a team-produced television show/infomercial featuring a nickname-supporting "full-blooded American Inuit chief" who isn't actually a chief and may not even be Native American; and hiring a man accused of misusing $1 million in federal funds from the Bureau of Indian Affairs to head a "Washington Redskins Original Americans Foundation" intended to help Native Americans. Speaking of that foundation, why not call it "Washington Redskins Original Redskins Foundation" if the nickname is a laudable term of honor? Good question. Sounds like something an expert linguist would ask. Snyder told USA Today that he will NEVER change the Washington NFL team's nickname, and to put the word "never" in "caps." For argument's sake, suppose a trademark loss eventually forces him to reconsider. How much would changing the nickname actually cost? .. the exact price of a nickname change is hard to estimate -- in part because the teams and schools that have switched monikers typically haven't shared their costs publicly; in part because unaffiliated sports branding and marketing experts don't have access to the proprietary team financial data needed to calculate a number. That said, it's possible to make a reasonable, educated guess. In 2010, Charlotte Bobcats owner Michael Jordan told Charlotte Observer writer Scott Fowler that it would cost him between $3 million and $10 million to change the team's little-loved nickname. (NBA insiders say Jordan's estimate is accurate). A source with knowledge of financial operations in professional football estimates that the cost for a "significant NFL team" might be as high as "$10 million to $20 million." Where does the money go? Think naming consultants. (Someone has to come up with replacement monikers, like "Warriors" and "Pigskins.") Think lawyers. (Someone has to vet those same names, a tedious affair; according to New York-based brand expert Allen Adamson, "for every 10 names you think of, nine are going to be unavailable.") Think having to revamp every single thing -- from stadium signs to uniform patches to front office stationary to the pixels in "Madden NFL" -- featuring a team logo or nickname. In other words, a name change likely would cost Snyder more than former free-agent bust Adam Archuleta and less than former free-agent bust Albert Haynesworth. So it's totally affordable. The bigger unanswered question is whether rebranding would lower the team's potential sale value -- though given that the Los Angeles Clippers are about to fetch $2 billion, that seems rather unlikely. Also remember: as an opportunity to sell tons of new merchandise to a loyal, rabid fan base, a new name could potentially pay for itself. What would Snyder call the team? Sea Dogs? (Just kidding). Hard to say. In 2000, Snyder reportedly trademarked the nickname "Washington Warriors," explaining that he might use it for an Arena Football League team. More recently, TMZ reported that Snyder's neighbor registered the name "Washington Bravehearts" for "entertainment" use "in the nature of football games." Other suggestions include Griffins - get it? - Redtails and Pigskins. Also, inside-the-Beltway anti-tax activist and occasional stand-up comic Grover Norquist told Buzzfeed that he endorsed the idea of renaming the team the "Washington Reagans" after Ronald Reagan. Because Washington. We have. In 1992, a group of Native Americans filed a similar petition with the USPTO and won their case that the nickname was disparaging; lost a 2003 team appeal when a district court concluded there wasn't enough evidence to show that Native Americans in the 1960s found "Redskins" disparaging; and eventually lost a final 2009 appeal when a federal court ruled that the petitioners waited too long to file their claim in the first place. More legal appeals. More public posturing. More letters. More articles. More pressure. More of the same, basically, barring a sudden change of Snyder's heart. So the fight isn't over? Not even close. Though say this for the USPTO's ruling -- it means that Snyder and the Washington NFL team finally will have something to fight for in the month of December.